Associated Bank’s president and CEO, Phil Flynn, was joined by Green Bay Packers CEO Mark Murphy and Allen Edmonds Shoe Corp. CEO Paul Grangaard, as well as three Packers wide receivers, Jordy Nelson, Randall Cobb and Davante Adams, at a recent Lessons from the Gridiron event in Milwaukee to discuss the importance of leadership and the ability to adapt to change. The three CEOs explained what they each encountered when they took their jobs, their toughest challenges and what types of changes they needed to make in order to make their companies successful. Flynn talked about the $80 million in investments Associated has made in improving technology and making it easier to conduct banking transactions. After the CEOs presented, Nelson, Cobb and Adams talked about how they deal with adversity on the football field and in the locker room. 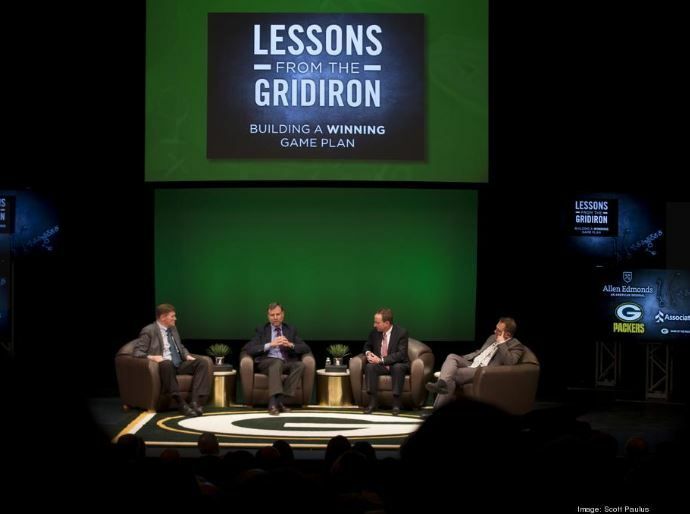 Photo caption: Mark Murphy, Green Bay Packers CEO; Paul Grangaard, Allen Edmonds Shoe Corp. CEO; and Phil Flynn, Associated Bank CEO were interviewed by ESPN Milwaukee’s Jason Wilde during a Lessons from the Gridiron event.